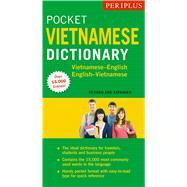 Look up words quickly and easily with this travel-sized Vietnamese dictionary. Intended for use by tourists, students, and business people traveling to Vietnam, Pocket Vietnamese Dictionary is an essential tool for communication and a great way to learn Vietnamese. It features all the critical Vietnamese vocabulary appropriate for beginning to intermediate students. It's handy pocket format, and easy-to-read type will make any future trip to Vietnam much easier. In addition to being an excellent English to Vietnamese dictionary and Vietnamese to English dictionary, Pocket Vietnamese Dictionary contains essential notes on the Vietnamese language, Vietnamese grammar and Vietnamese pronunciation. All words are written in Romanized Vietnamese so that in the case of difficulties the book can directly be shown to a native Vietnamese speaker. Phan Van Giuong is a distinguished professor in Vietnamese Studies at Victoria University, Melbourne, where he has been teaching English and Vietnamese since 1965, as well as being the coordinator for the Vietnamese Language and Culture Studies program at the university's Faculty of Arts for the past 18 years. Prof. Giuong is the author of many Vietnamese texts and language learning materials, as well as the editor for Vietnamese magazines and newspapers. He was awarded several medals, including the International Educator of the Year's for his outstanding contributions to teaching language and culture. He is also active as a setter and marker for exam papers, such as the International Baccalaureate (IB).